The term Carriage Return was originally coined after the lever mechanism used by old typewriters to return to the left and advance the paper to the next line. In modern times, the concept seems to be used interchangeable between Line feed (LF) -the ASCII code (10) that move the cursor or a printer down one line (LF button in dot-matrix printers), followed by paragraph break or hard return.in current word-processing packages. Regardless of the terminology variation, when editing text notes or schedules in Revit you often need to add carriage returns. This is easily done by clicking the ENTER key. The ENTER key breaks a text note. Carriage returns in Schedules are a different story. Pressing the ENTER key while editing a cell in schedule would not create a carriage return, but close the edit mode of a cell. The widely known workaround is using the shortcut CTRL+ ENTER. The CTRL + ENTER key combination would create a carriage return. While CTRL+ENTER does work, editing the cell to add the desire break is really cumbersome. The schedule view would never display stacked lines, only single lines. The up and down arrow keys won't jump the cursor to the paragraphs below, nor the PgDN or PgUP. The only way to make edits across multiple paragraphs is by dragging the cursor to the right or left and clicking the forward or backspace as many times as needed to get to the appropriate character. Dragging a selection of text to the cell border would move the cell string to a different paragraph line. The drop down arrow selector on right side of the cell will reassign the text to either one of the paragraph and delete the rest. CTRL+ENTER would assign for each paragraph an independent choice. Do not use or you will have to retype the entire text note. Do not use the drop down arrow selector in a multi-paragraph note. It will keep a single paragraph and remove the rest. Troubling as it is, while editing multiline cells is possible, you cannot add an empty line at the end of the paragraph. The CTRL + ENTER combination at the end of a paragraph in a cell will not create a carriage return, a major formatting drawback and a long standing feature request½ or is not? We researched the issue and found a workaround reported by some users who were able to add an empty line by adding the ASCIII 'empty space character' code at the end of carriage return. (CTRL+ENTER followed by ALT+0160). I was, for some reason, unsuccessful to make it work, at least on my installed RAC 2015 R2 version. But one way I make this work (or faking it to work?) is by adding a parameter that creates an invisible narrow column with enough character values to force the return. Here is the workaround: I created a new parameter of the integer type, added a number of characters equal to the number of lines plus one, and reduce the column width to a single character. 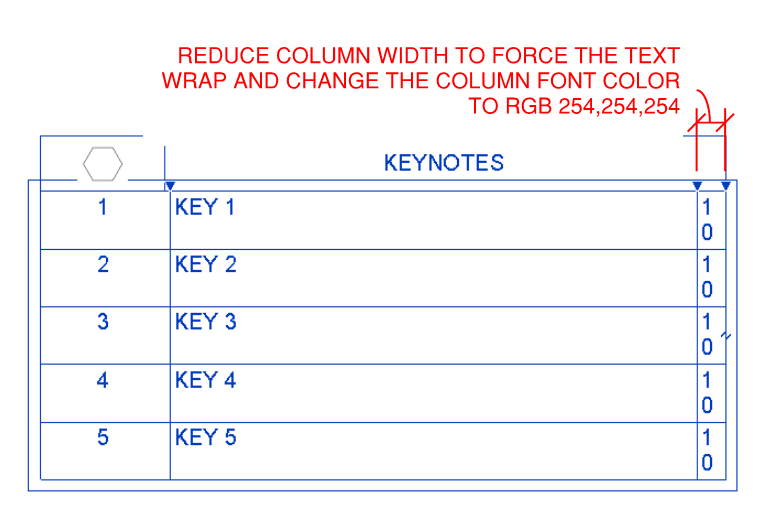 Create a blank space at the end of a cell, add a parameter that create a narrow invisible column with a number of characters equal the number of lines plus one, and change the column font color to RGB 254-254-254. RGB Color 254,254,254 will never print. To make the column invisible, change the font color. Changing the color to true white directs REVIT to display it in Black, therefore, change color to RGB 254,254,254 which is technically a grey color so light that it would ever print. For lengthy schedules with various paragraph lines per cell, this method would be somewhat tedious. The task, though, would be far easier if we could make the edits in Excel. Using Ideate BIMLink, you can export the data to an Excel Spreadsheets and add the 'invisible' characters there. 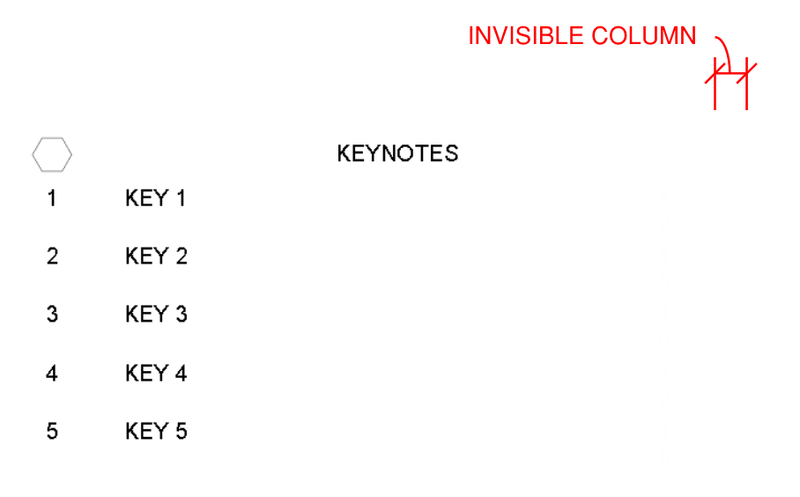 Edit all your keynotes descriptions in Excel, making sure you add manually the 'carriage return' where needed. In Excel, the carriage return is added manually using the ALT+ENTER combination. The idea is to create populate the 'invisible parameter' with a total number of characters that equal to the amount of line spaces in a cell plus one. The final formula to create a value that equal the amount of line spaces plus one is as follows: =POWER(10,LEN(C2)-LEN(SUBSTITUTE(C2,CHAR(10),"")))*10 -If the number of line spaces in a cell is 2 = 100 - If the number of line spaces in a cell is 3= 1000 - If the number of line spaces in a cell is 4 = 10000½ etc. The data can then be reimported into Revit, forcing the 'narrow' column to wrap and giving you that magical carriage return space. Watch a video on Carriage Returns on YouTube.